Does a Bankruptcy Discharge Reverse an HOA Foreclosure for Unpaid Dues? When you get behind on your dues, your homeowners association can begin foreclosure proceedings against your property even if you are current on your mortgage and other debts. Though bankruptcy can give you a financial fresh start, it does not reverse past consequences of your debt. Thus, bankruptcy cannot reverse a foreclosure caused by your unpaid dues. However, bankruptcy can help you stop the foreclosure process if it is not yet complete. Generally, HOA foreclosure procedures are similar to the procedures your bank must follow. State laws vary regarding HOA foreclosure procedures, and some HOA requirements are specific to your HOA’s governing documents. For example, Florida law permits HOAs to foreclose on a property only after the HOA makes a formal demand for payment and gives you 45 days to bring your account up to date. You may end up paying more than your unpaid dues, however, since your HOA can tack on fees, legal costs and interest for overdue amounts. If you do not pay, your HOA can file a lien against your property, thereby beginning the process of selling your house through foreclosure. In some states, like Texas, HOAs can collect on liens without involving a judge, and your property could be sold on the courthouse steps for much less than it is worth. Once you file for bankruptcy, you are protected by an automatic stay, or postponement, of collection actions against you. This stay applies to HOA foreclosures as well as any other attempts by the HOA to collect past due amounts. Thus, the HOA cannot move forward with an incomplete foreclosure no matter how much you owe. If the foreclosure has already taken place and the title to your home is no longer in your name, the automatic stay does not stop the action since you no longer own the property. At the end of your bankruptcy case, if you have completed all the necessary requirements, the court can grant you a discharge, or elimination of your remaining unpaid debts. However, a discharge does not reverse a completed foreclosure, so you will not get your home back if you lost it prior to filing your bankruptcy case. If your HOA did not file a lien before you file your bankruptcy case, your pre-bankruptcy unpaid dues are eligible for discharge like other unsecured debts. Thus, you may not have to pay them at all or may only have to pay a small portion, depending on the type of bankruptcy and your specific circumstances. You are still responsible for paying dues that accrue after you file your bankruptcy petition. If you file for Chapter 7 bankruptcy and your HOA files a lien before you file for bankruptcy, the lien is treated like a mortgage. It becomes debt that is not dischargeable and must be paid. After your bankruptcy case is complete, the HOA can foreclose on your property if you do not pay this lien. If you file for Chapter 13 bankruptcy, an HOA lien can be removed by the court if your house is worth less than what you owe on your mortgage. If your house is worth more than you owe on your mortgage, the court will not remove the HOA lien, and you must pay the lien as part of your Chapter 13 repayment plan. Fremont Bankruptcy Attorney Blog: What Happens to My Unpaid HOA Dues if I File Bankruptcy? Law Office of Emil Fleysher, P.A. : Can My Homeowner’s Association (HOA) Foreclose on My Home? Bankruptcy can help you get a fresh start financially by eliminating many of your debts or giving you a chance to catch up on debt payments. Filing bankruptcy in New Jersey does not eliminate child support arrearages, but it may allow you to stop making payments on your arrearages for a while. If you are renting an apartment and filing for Chapter 7 bankruptcy, you will have to make an important decision regarding the lease that you signed. The bankruptcy law considers unpaid rent as a form of unsecured debt; this debt may be discharged at the end of the bankruptcy process. However, your landlord may evict you for non-payment of current and future rent. If you wish to stay in your home, you have options. 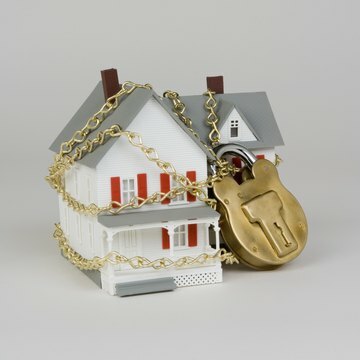 When Does the Bank Take Possession of a Home in Bankruptcy? Banks cannot take possession of a home without a foreclosure proceeding. Foreclosure is not part of the bankruptcy proceedings, although it often occurs immediately thereafter. How bankruptcy and foreclosure play out with regard to whether or not you lose your house is determined by the type of bankruptcy proceeding, the location of the property and whether you have sufficient income to pay future mortgage payments. What Happens When You Reaffirm a Vehicle After Bankruptcy?